Kendo and Jodo training lessons are coached by Luigi Rigolio (Kendo 6th Dan - Jodo 5th Dan), one of the first Chairmen of Confederazione Italiana Kendo (Italian Kendo Confederation). He started Kend practice over 25 years ago and has been a constant member in the Italian national team, from 1992 to 1996. He practiced for several years also Karate and Kyudo, the traditional Japanese archery. 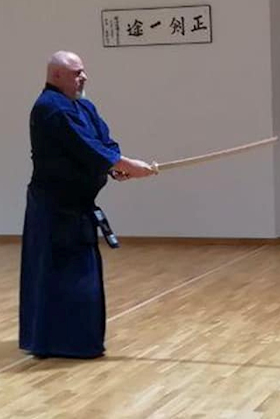 Iaido training lessons are coached by Valerio Sonvilla (3rd Dan iaido, 4th Dan Jodo). He began, in 1975, to practice Judo, Aikido and Karate; more recently he started to work on ancient Japanese weapons practiticng Katori Shinto Ryu, Jodo and Iaido. Some results of this activity are several placements in Italian Iaido Championships (2008 and 2009) plus a third place in the European Jodo Championship (2006). From 2010 to 2012 he was in the Jodo national Technical Commission.